DHADING, Jan 5: While waiting for the post-quake reconstruction grant from the government, Shree Ram Gurung of Khaniyabas-4 in Dhading district has already spent two-and-a-half years, living in a temporary shelter. His house was severely damaged by the devastating earthquakes of 2015. Despite being a quake victim, he was not deemed eligible to receive the reconstruction grant by the government. 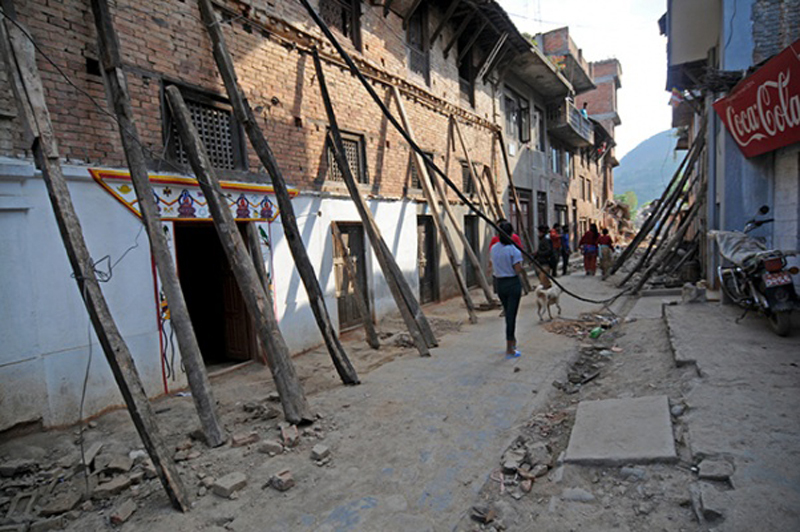 He has already appealed to the government authorities concerned twice for the grant since the quake but to no avail. The National Reconstruction Authority (NRA) had collected names of the victims eligible for the reconstruction grant in the village. “I have already filled up the form for the grant twice. But nothing happened,” said Gurung. His neighbors have already begun rebuilding their houses after receiving the first tranche of the grant. Gurung can only watch all this helplessly. “There are those who have received the grant although their houses were not damaged. But despite being a genuine victim, I have been deprived of it,” he said. His temporary shelter does not provide any protection against the unbearable cold of the chilly winter. It wasn't of much help during the monsoon, either. “I had hoped to spend this winter inside a new, warm house. But that's become just a dream,” said Gurung. Although engineers had visited his home for observation and made him fill a form, his name was not published in the list of those eligible for the reconstruction grant. He filled another form the second time but to no avail. “The government has deprived me of the grant. I do not have the financial capacity to erect the house by myself,” he added. Gurung also visited the ward office, rural municipality office and the district coordination committee. However, the government officials only blame each other and offer no help, he said. Krishna Bahadur Bhujel of Gajuri-1 has a similar plight. The quake destroyed his home completely but he too has been deprived of the grant. He has already appealed to the NRA thrice, but to no avail. “The government authorities have excluded genuine victims like me and made them suffer in the winter and monsoon,” he said. So far, 57,681 quake victims have received the first tranche of the grant while 16,791 have submitted applications for the second tranche of the grant. Only 14,234 victims in the beneficiary list have completed their houses, according to Rojan Shrestha, an engineer at the Urban Development and Building Division Office, Dhading.